Our brewery is located on the northwesterly tip of Orkney’s mainland, a wind-battered area known as Swannay. Brewing in a rustic farmstead we’re in a unique location: showered in spray from the Atlantic Ocean in the winter and surrounded by fertile farmland in the summer. Our Craft Beer Shop is open to visitors Monday-Friday 10-4, selling a wide range of bottled beer, merchandise, and other guest beers. Unfortunately at the moment we can't offer tours, food, or drinks for consumption on the premises, but we are happy to answer any questions you might have about us and our beer. 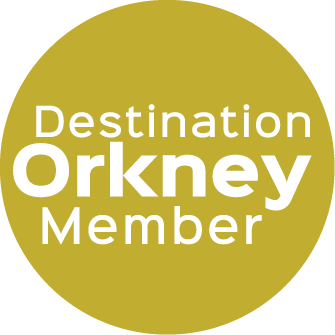 As we are a small team here, we advise checking our social media or website prior to your visit for confirmed opening hours during your visit to Orkney. Using only one strain of yeast, we brew beer styles from low strength, hoppy session beers to double-digit strength, barrel-aged porters. All of our core range brands have won awards at national or international level - totaling over 100 in just over ten years of brewing - surely making us one of the most decorated Scottish breweries of recent times. Once a dairy farm producing farmhouse cheese, our cluster of farm buildings is as much a labour of love as our beers. A mixture of cow sheds, barns and coldstores that used to house beasts, cheesemakers and tonnes of maturing cheese; the whole site is connected by our sheltered courtyard that you enter under the archway - the shape of which now forms part of our logo. Our founder Rob Hill - ever the collector - first came to Swannay Farm in 2003 looking to buy the old time clock. One year later, after being let-go from his then current head brewer job, he somehow bought the whole building complex and started to think about how to make beer at Swannay. With no means or desire to purchase a shiny new brewing plant, Rob went on the hunt for something that’d been used before. He ended up with not one but three kits(! ): a five brewers barrel (BBL), a 20 BBL and a 100 BBL. Already with twenty-five years’ brewing in his boots Rob knew exactly what the first beer needed to be: Scapa Special, our flagship pale ale that still accounts for around a third of all we brew today. It wasn’t long before the five BBL kit was up to four brews a week using just three fermenting vessels. This was no mean feat considering Rob was also doing all the delivering, cask washing, sales, admin - literally all tasks involved in running the company - himself. Around about 2010 Rob’s son Lewis returned home from university and (perhaps foolishly) started helping out at the brewery. The 20 BBL plant was soon ‘commissioned’ and production volumes continued to increase. Today a team of six comfortably brew Swannay’s range of modern classic beers four to five times a week. We have two brewhouses that are used according to demand. The original five barrel plant (one barrel is 164 litres) and a marginally newer twenty barrel plant. Fermentation space totals 125 barrels but we run under capacity so that our beer and ourselves are never rushed. Swannay’s growth has been controlled, steady and strong. We’re proud that we have fantastic local support on Orkney and still sell around a quarter of all our beer on our home island. Far from our early days as a one-man, cask beer producing brewery; Rob, Lewis, and an enthusiastic team package beers into cask, keg and bottle for shipment throughout the UK and, increasingly, worldwide.